Kellogg Prof. Nicholas Pearce delivers the keynote speech during the Martin Luther King Jr. Day Candlelight Vigil. Pearce discussed the importance of working hard to promote justice and equality. 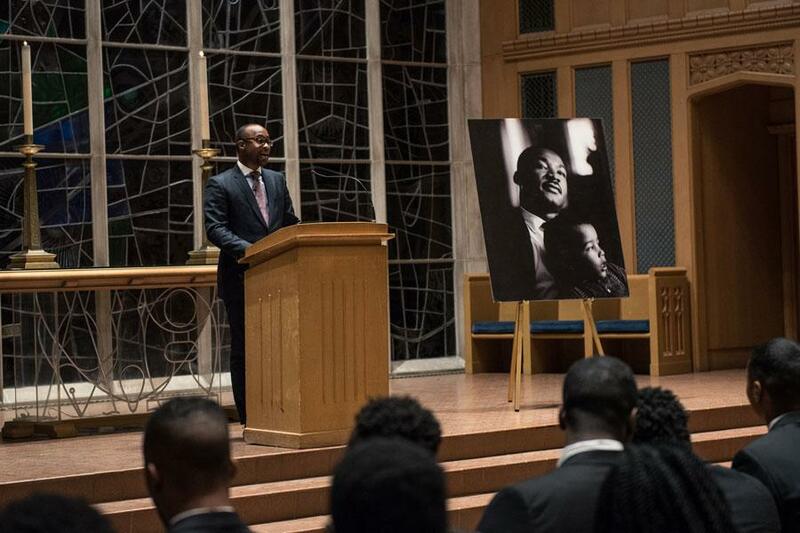 Candlelight and solemn voices filled Alice Millar Chapel on Monday during the 37th annual candlelight vigil honoring the life and legacy of Martin Luther King, Jr. The vigil, started in 1980 by the Alpha Mu chapter of Alpha Phi Alpha fraternity, is held every year in celebration of Martin Luther King Jr. Day. The result of a year of planning by the Evanston Campus MLK Commemoration Committee and Alpha Phi Alpha, this year’s vigil featured a keynote speech from Kellogg Prof. Nicholas Pearce and a ceremony in which excerpts from King’s speech, “Where Do We Go From Here” were read. In his address, Pearce spoke about the importance of using a college education to improve the greater community. Life should not be lived on autopilot, but should be built on the goal of bettering society, Pearce said. In addition to being a professor at Kellogg, Pearce is also involved in several religious and community organizations across the Chicago area, including the Chicago Community Trust’s African American Legacy initiative, where he serves on the board, and the Apostolic Church of God, where he is an assistant pastor. Following Pearce’s address, McCormick senior Joshua Wright, a member of Alpha Phi Alpha, read from King’s 1967 speech “Where Do We Go From Here” as attendees lit candles. The event also included a musical performances by a cappella group Soul4Real and an invocation by Associate Chaplain Tahera Ahmad, who spoke about King’s relationship with Malcolm X and recited verses from the Quran. Alpha Phi Alpha first started the vigil to commemorate King, who was a member of the fraternity, before the creation of Martin Luther King Jr. Day. The vigil also provides an opportunity to reflect on the work of King and the work left to be done toward racial equality, said Whitaker, who has co-chaired the committee for four years. Since the first vigil, the celebration has grown to a week of programming commemorating King, including a day of service and a student orator contest. Alpha Phi Alpha Chapter President Damilola Arowolaju, who also served on the planning committee, said he was happy to see how far the celebration has progressed.